This compact, over-the-shoulder, insulated wine tote is perfect for picnics or romantic outings. 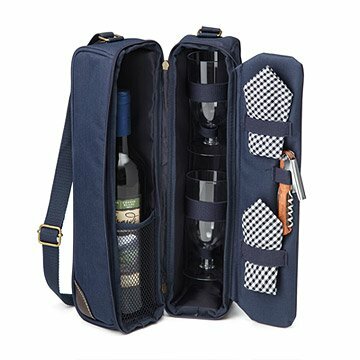 Perfect for picnics or a romantic outing, this compact, over-the-shoulder, insulated wine tote includes two glasses, blue and white checkered napkins, a waiter's tool with corkscrew, and a separate insulated compartment to keep your wine at its correct temperature. Made in China. I wish the cups were a higher quality, other than that, it's great. It is a Christmas gift, so I will not be using it. My friend said, "how did I now already own this?" Perfect gift for wine lovers on the go! Truly a great gift for someone who likes to get outdoors and have a bottle of wine, or even a self-gift for your picnicking adventures. The overall tote seemed really well made and everything fit snugly in place within so as not to get loose. The zipper was a little tough to move over the corners but it seemed due to the compact design, which then was a good thing as the wine bottle inside wouldn't be sliding around. The wine glasses were the only thing that felt a little cheap compared to the rest of the tote, but those could easily be replaced with a nicer plastic/metal cup. We used it to bring wine to the beach and it. It kept the wine at the temperature my mom wanted it at. This is a fun tote for a picnic in the park or at the beach. It is compact and made from a sturdy attractive fabric. The glasses are plastic but in a separate protected compartment from the wine bottle. There is a handy wine opener and two cute gingham napkins. You will need to carry food separately. I found this for my daughter and thought she might like it. She LOVED it! She and her boyfriend can head to the park with their wine holder or carry a bottle to a friend's house safely and easily.